For years I’ve raged against the invasion of the very American Halloween and associated trick or treating; in the UK, we have All Hallows Eve, from which Halloween is derived. Just five days later we have our very own Guy Fawkes Night, with its pagan effigy burning associations – OK Guy Fawkes was a Catholic, but never mind. Well, finally I’ve come to the conclusion that if you can’t beat them you’d better join them and this chocolate pecan pumpkin cake seemed like a good start. In fact I had no choice; this month’s We Should Cocoa theme is Halloween. For Random Recipes this month, Dom has tasked us with picking a recipe from the internet. His suggestion was to type a theme into the search box and then pick a recipe randomly from the first ten that appear. I was game. To bag several challenges in one, I searched for chocolate and pumpkin, thereby getting We Should Cocoa in as well as Tea Time Treats which has vegetables as this month’s theme. The recipe that popped up was Dan Lepard’s pumpkin chocolate mud cake – perfect. It’s been a while since I made a Dan Lepard recipe, or should I say tinkered with one. I did of course change things around just a little. I replaced vanilla with fennel, added coffee to the mix and changed the quantities. I included some maca powder, as I often do, just so I can tell myself that cake is good for me. I also added cream cheese to the icing to give it a bit more character and make it less sweet and sickly. 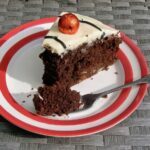 Adding coffee to a chocolate cake is a really good way to enhance the chocolate flavour. It’s a trick I often use. Vegetables can also work well in a cake, giving moisture and body. Just think carrot cake. Pumpkin or squash is a particularly good one to use as you can see in this almond and squash cake. I’ve also made any number of beetroot cakes, such as these beetroot & orange brownies, nettle cakes, an kale apple cake and an exceedingly good spinach cake. Decorating aside, this chocolate pecan pumpkin cake is really easy to make. It’s just a case of mixing everything together in a pan, then pouring it into a cake tin. The icing is pretty simple to make too. It also feels rather decadent with its tot or two of rum. This can, of course, be left out if children are likely to be around. The chocolate pecan pumpkin cake was such a success, I shall be making it again for sure. It was soft, light and mousse-like with a welcome crunch from the pecans and the fennel note gave an intriguing, “what is this?” It wasn’t overly sweet, which is good because the icing was. The rum icing may have been sweet, but it was nonetheless delicious and complemented the cake well. An added bonus was that it lasted well over a week and was just as good at the end as at the beginning. A delicious light-textured and mousse-like chocolate cake with crunchy pecan pieces and hidden veg. It's covered in a rum flavoured cream cheese icing. Halloween decorations entirely optional. Melt the butter and chocolate in a large pan over gently heat. Remove from the heat and beat in the sugar, followed by the eggs, followed by the coffee. Stir in the fennel extract if using. Stir in the pumpkin and pecans. Scrape the mixture into a deep 9" silicone mould or lined tin and bake at 180℃ for 55 mins. Leave to cool for 15 minutes, then turn out onto a wire rack to cool completely. Melt the butter and mix in some of the icing sugar. Beat in the cream cheese, followed by a little more of the icing sugar. Add the rum along with some more icing sugar and beat again. Add the cream, followed by the rest of the icing sugar and beat until smooth. Place the cake on a stand and spread the icing over the top. Create a spider's web on top with the black icing. Add some chocolate pumpkin faces for good measure. 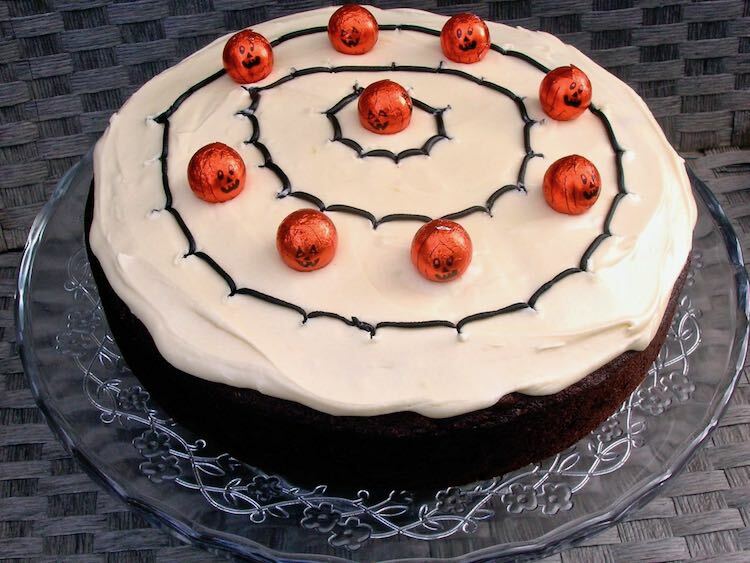 Finally, I’ve given in and I’ve made a Halloween bake. It’s all down to the devilish Hannah over at Honey & Dough, who is guest hosting We Should Cocoa this month. Random Recipes was the driving force behind this chocolate pecan pumpkin cake with its theme of something sweet, randomly selected from the internet. This is a splendid monthly challenge from Dom over at Belleau Kitchen where we never quite know what recipe we will land up with next. I made sure to get a recipe containing pumpkin so I could also send this off to Karen over at Lavender and Lovage for her Tea Time Treats. The theme is vegetables this month. This monthly challenge is co-hosted by Jane over at The Hedge Combers. I reckon, this chocolate pecan pumpkin cake is is just right for this month’s Baking with Spirit over at Cake of the Week. It has rum in the icing and pumpkin in the cake; the theme is autumnal. Love Cake over at JibberJabberUK is also all about the dark side this month, so I am sending this Ness’s way. 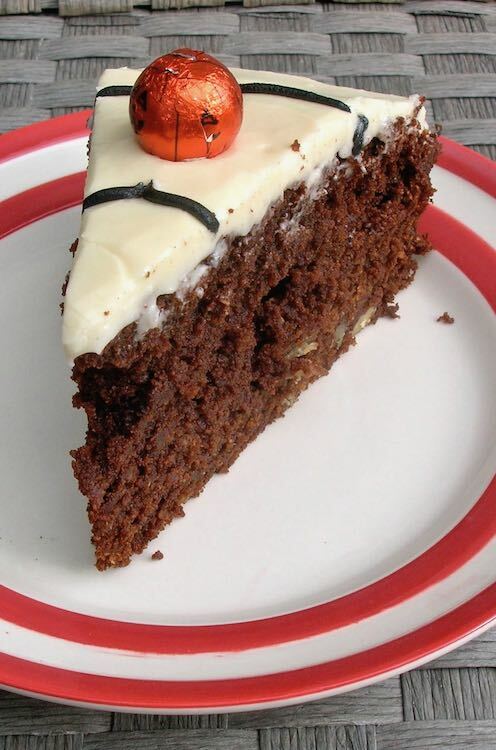 This scrumptious cake has hidden veg in the form of pumpkin, is I’m sending it off to Extra Veg. It’s being guest hosted this month by Emily over at A Mummy Too , but it’s normally hosted over at Fuss Free Flavours and Utterly Scrummy Food for Families, . Finally, a slice of my chocolate pecan pumpkin cake has got to go to Let’s Cook for Halloween over at Simply Food. Do let me know if you ever make this chocolate pecan pumpkin cake for Halloween (or any other time). I’d love to see your photos, especially of something a bit more expertly decorated than my own. For more delicious and nutritious recipes, follow me on Twitter, Facebook, Instagram or Pinterest. Chocolate Pecan Pumpkin Cake. PIN IT. Haha Dom, you’ve outdone me on the spooky orange and black this year – well not so much spooky as ghastly! Wow, you baked yourself one awesome looking cake! I am literally drooling at this! It has been far too long since I had chocolate! Oh no Latoyah, no chocolate? But you are doing really well. Perhaps a reward soon? Yes Johanna, it’s the commercialisation of Halloween I object to – not the festivity itself. This cake look yummy! I love all the flavors you have going on in here. And, I love Halloween! so this is perfect! Oh no Laura, what do you object too? Lovely looking cake and I think your spider pattern is looking good! 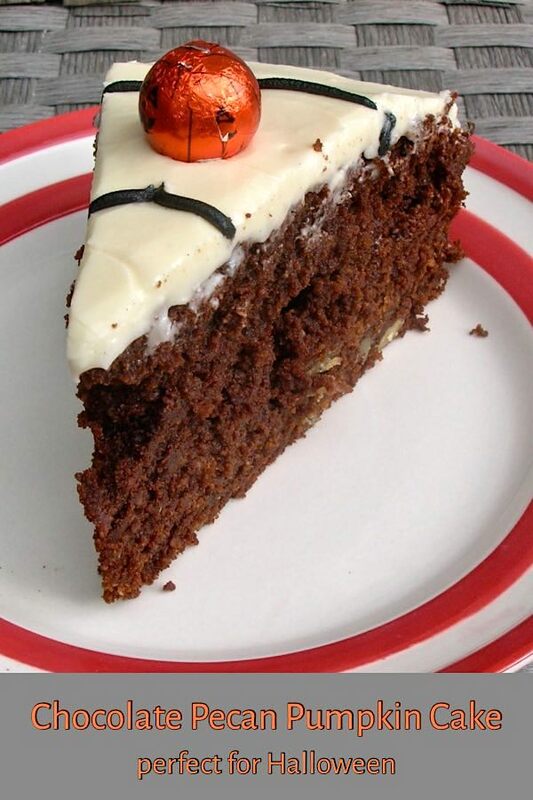 It looks delicious and I especially love the sound of the icing – I’ve also made my very first Halloween cake this year too! I don’t mind holidays coming over as it gives us more things to celebrate. Now I just need to learn how to bake more treats for said holidays starting with some from your blog. Great recipe 🙂 I love how it is decorated too! I love cakes made with pumpkin and this one is amazing! The rum icing is a perfect way to finish it off – sounds wonderful. Thanks Katherine. I agree, pumpkin works really well in cakes. Just wish we’d managed to grow some this year. Thanks for entering Baking With Spirit! The cake looks great, and I love the sound of that flavour combination. Rum in the icing sounds like a winner. The icing was a real winner Janine and twas the rum that made it. This looks super tasty and delicious , its the perfect entry for Lets cook for halloween event at my blog, inviting you to link the recipe. I love everything you did with this and would never have thought to put fennel in a cake! Well done. Lovely cake for Halloween. The flavour combination sounds interesting and it clearly works well together. Beautiful decoration and well done as always on all those blogging challenges. Shame AlphaBakes was not P or H this month!! Thanks Ros, I was wondering if I could get away with rum Icing, but thought probably not! 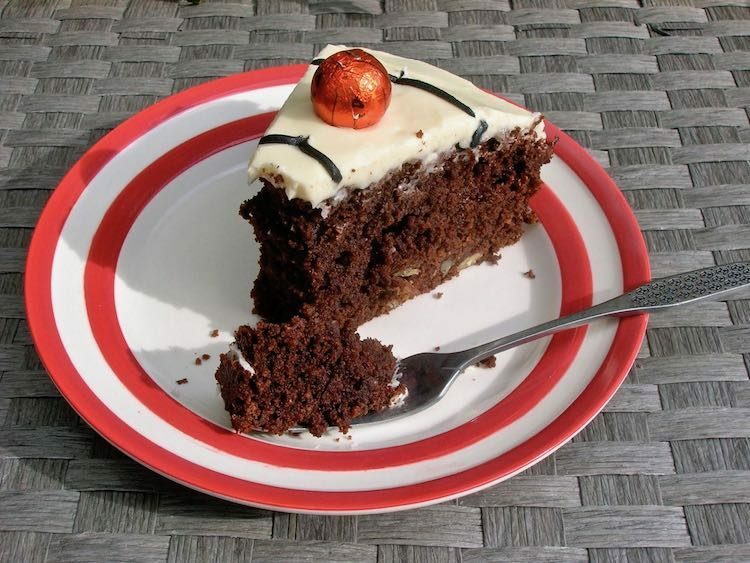 Hi there… we don’t tend to celebrate Halloween, but I do love the look of your cake! Thanks Lizzy. Well actually we don’t either – Bonfire Night is more of a British thing. Yum yum yum! What a rich, moist, chocolatey cake. I could happily sit and eat my way through this one….. Love the ‘slug of rum’ addition!!! This looks spooky and fun! I have never celebrated Halloween, but love to see all gorgeous treats that associated with the festival. Halloween was stolen from the pagans too – it’s the festival of Samhain where the portal between our world and the ‘other side’ opens and all the spirits can roam into our world. I celebrate Samhain, but not the commercialised Halloween! Gorgeous cake, so festive and pretty! Send me a slice! You mean you didn’t already get it Galina? Those flavours sound just…wow! A delicious (whisper it…halloween) treat of a cake Choclette! Haha Hannah, it’s good to get out of your comfort zone from time to time. I am so having a chilli spiked hot chocolate on Guy Fawkes night now – splendid idea. Thank you for hosting, there were some splendid entries. This sounds lovely! What a great combination of flavours. Perfect for Halloween. Thanks very much Kate. I do remember it as being a very nice cake.